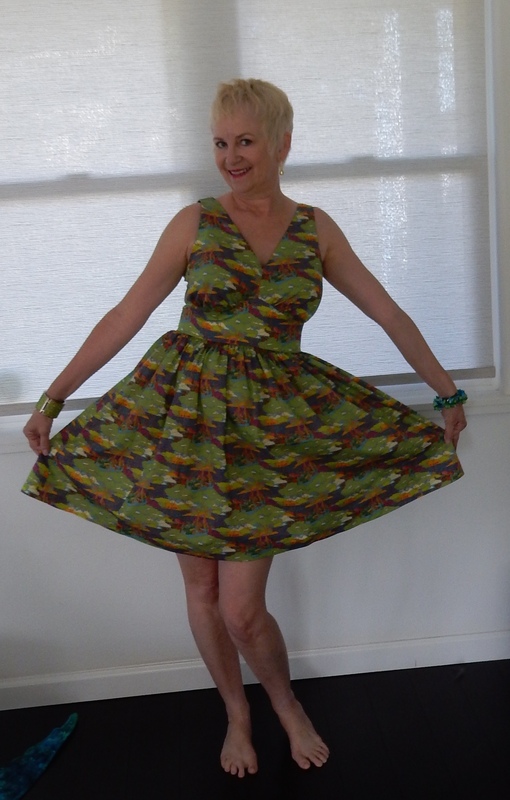 Yippee skippy, I have another new dress! 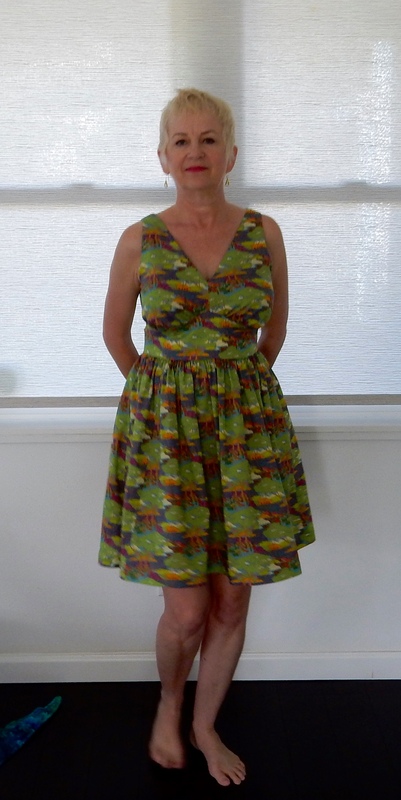 And I made it from some yummy Liberty fabric! Look at me, cutting into yet another one of my coveted lengths of Liberty Tana lawn. Every time I start a project with this fabric, I feel like I should have a ceremony before the first cut with the scissors. Not only is this fabric expensive, it has the nicest hand of any cotton I have ever sewn. This picture is a little fuzzy. I may have to fire my photographer. 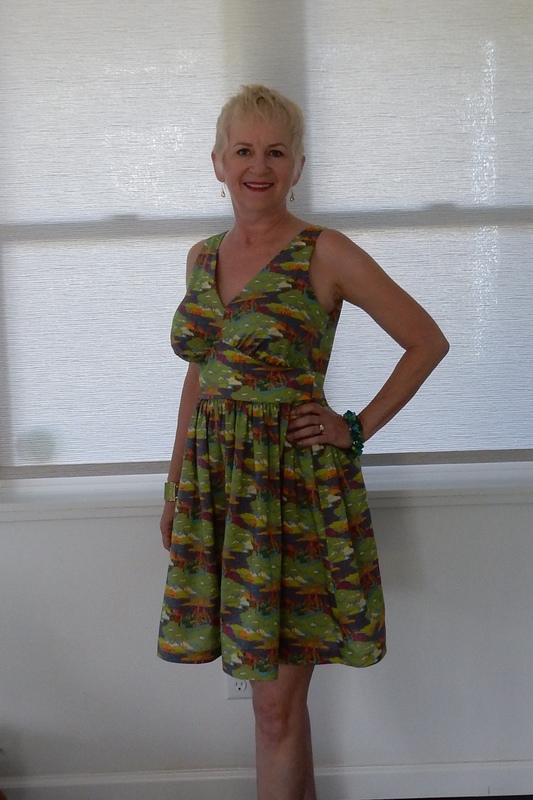 For this dress, I chose a pattern by Serendipity Studio called the Marilyn dress. The Serendipity patterns seem to be sized for what I will call, um, relatively flat-chested bodies. 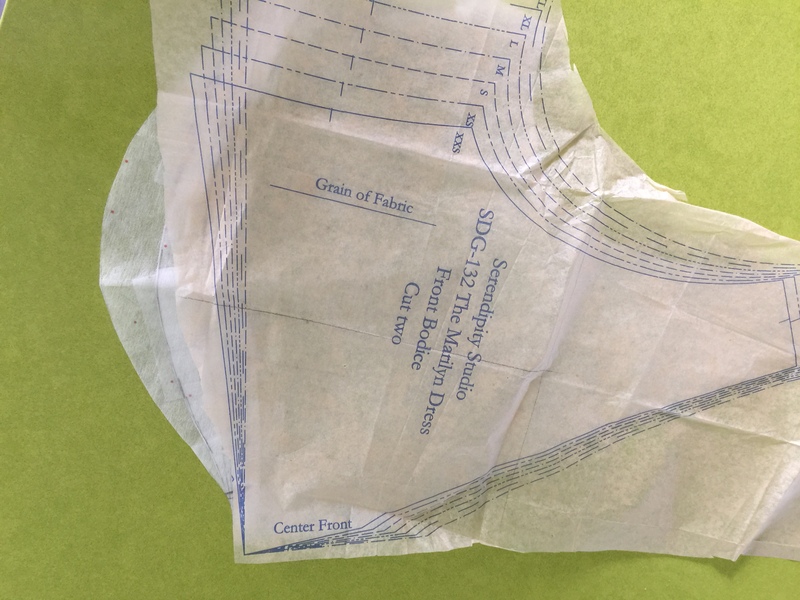 There is also a note on the back of this pattern that reads, “the length of the skirt will suit up to 5’4″ in height.” Oops, I just found that note. 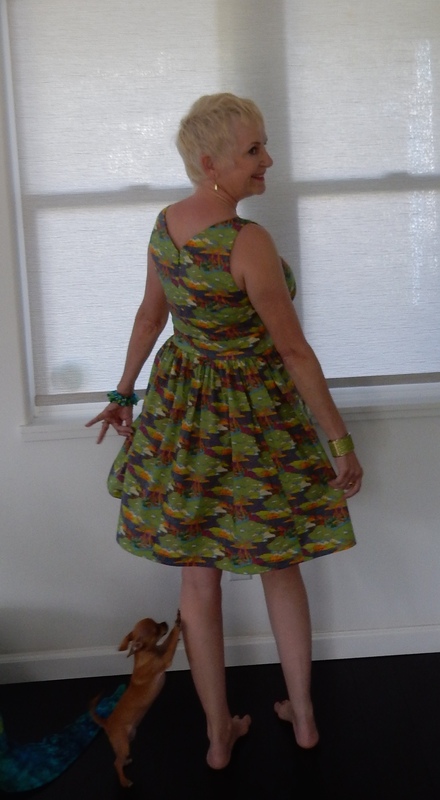 I took one look at the bodice front and knew it would need some adjustment. I re-drew the bodice, adding a generous amount of space to cover my not-flat-chested self. 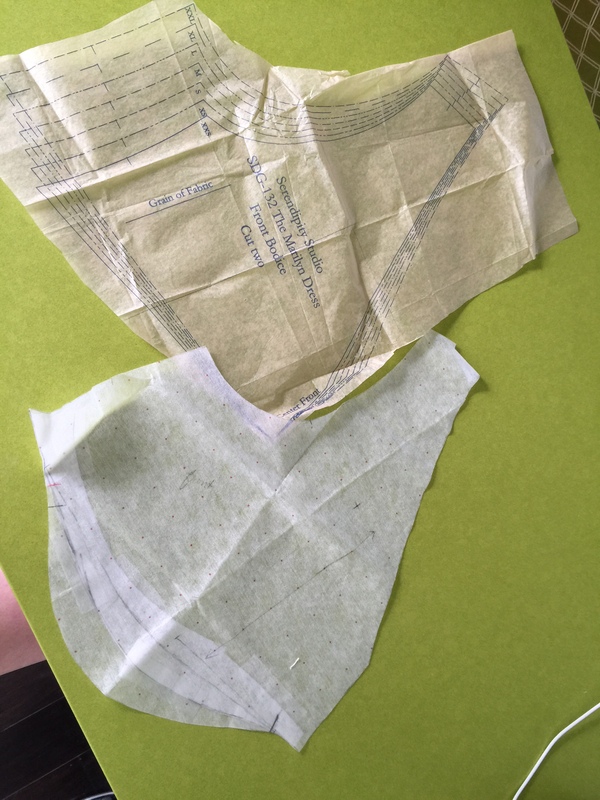 Here are the before and after shots of the front bodice. Here is the tissue pattern next to the redrafted pattern I used. The original laid over the new pattern piece. 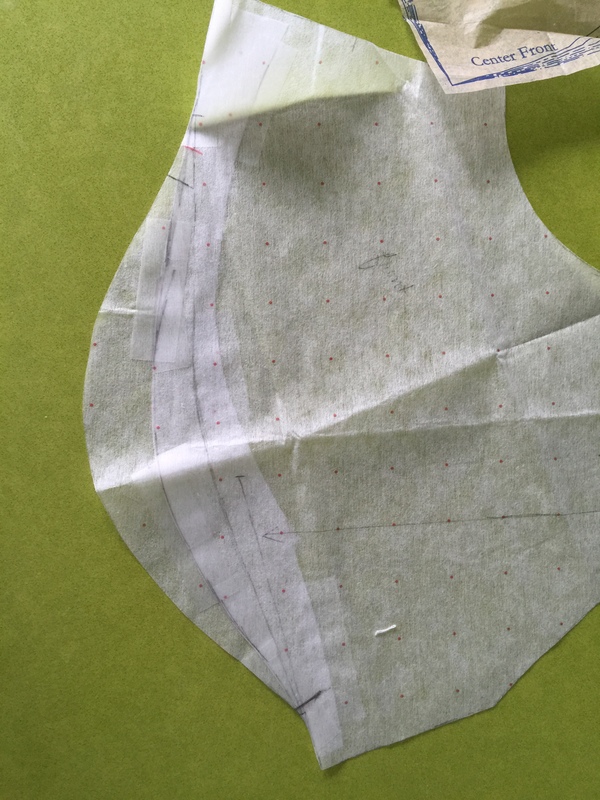 To cover everything that needs to stay inside the bodice, I added width and length to the pattern piece. I love the back v-neckline and the invisible zipper. I have a major supply of invisible zippers, so it’s easy to slap one in the garments I make. One of the wonderful things about invisible zippers is that it pretty much doesn’t matter what color the zipper is. If inserted correctly, the only part that shows is the zipper pull. The zip in this dress is kelly green. 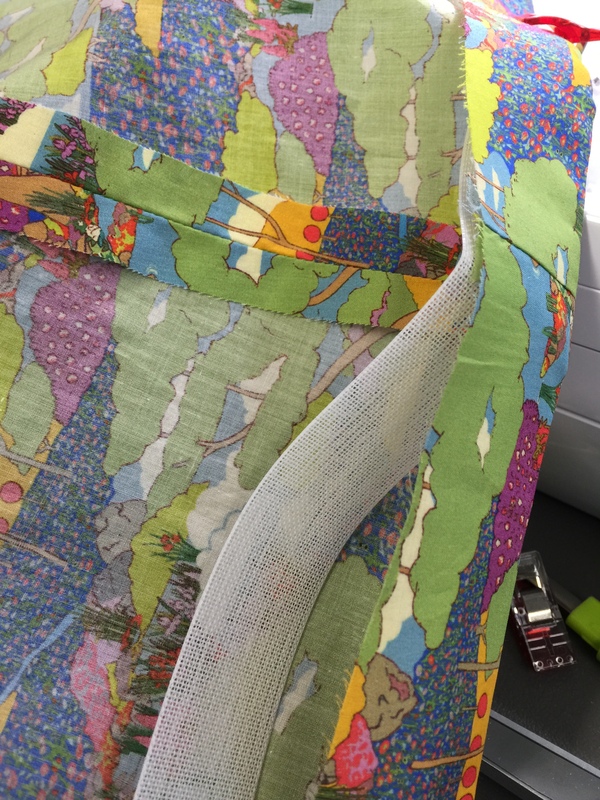 The Liberty lawn fabric is so soft and drapey. Now this is a good quality in a dress, in my opinion. However, that means that the hem of the dress hangs without any oomph. To plump out my hem, to get it to have some body, I decided to add some ban-roll interfacing. Ban-roll is a product that is typically used for interfacing waistbands. It comes in different widths. I measured and pressed my hem. Then I added the ban-roll, snugging it against the pressed hem. I basted it to the hem, then folded the excess hem over the interfacing. 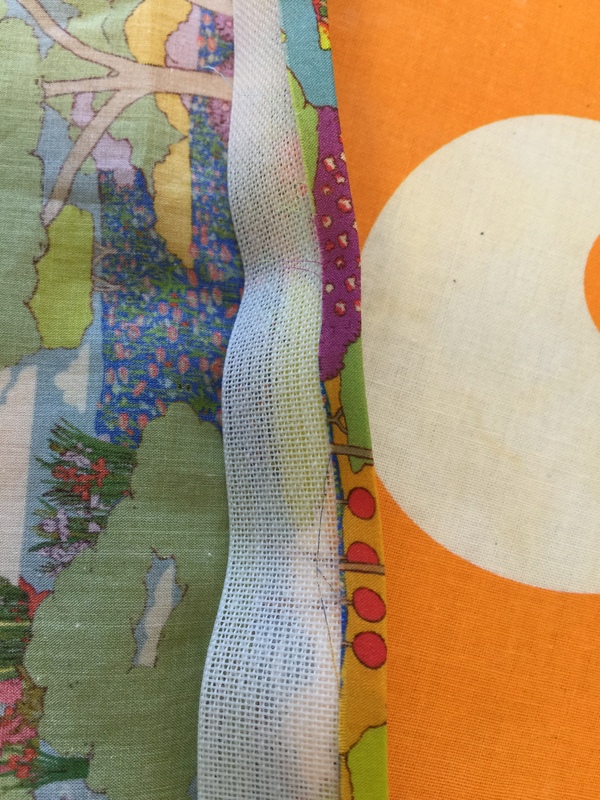 I pinned my hem into place, then used the blind hem foot and stitch on my machine. Because that’s how I roll. I will freely admit that the idea of hand sewing a hem makes me want to heave. I love my new dress. 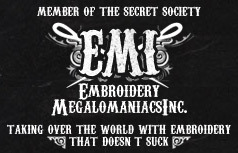 It will be a great garment for the hot and sweaty weather here. Would I make it again? No. While I like the shape of the dress and it’s components, the pattern is obviously sized all over for a petite figure. My bad for not measuring the length of the bodice, waistband and skirt before cutting. Lesson learned. Next Anglophile alert! Union Jack quilt squares and Liberty Tana Lawn fabric, all in one convenient place! Cute … the dress and model.